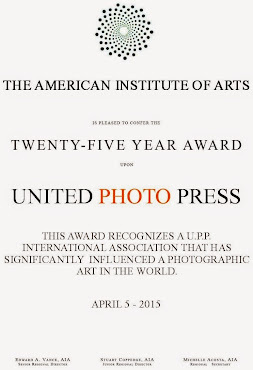 UNITED PHOTO PRESS HAS THE INTERNATIONAL PRESS ASSOCIATION CERTIFICATE No. 776543. The International Association UNITED PHOTO PRESS, manages this global portal, without speculation business, nonprofit or political in English language, and a Magazine www.unitedphotopressworld.org translated over 52 languages, with the aim of disseminating culturally from its members throughout the world and communities in general information about its activities initially identified with the areas of photography, photojournalism, audiovisual, multimedia, art and culture, environment, documentary as well as other related matters. Makes the promotion of books and drawings, as well as promote voluntary action in the various sectors of the media where it belongs, aims to value the arts as a cultural image and, therefore, promote exhibitions, workshops, roundtables, lectures, reading portfolio, projections, photography and literary issues and urban domestic and international. For the artists, everything counts. Nothing goes unnoticed by them nothing is contemptible. In its relentless production of images only have the discretion to escape the consensus of what is said from the images produced by all other non-artists. The art are the construction of a counterculture, not exactly in the sense of radical rupture with the social reality but in a sense that, precisely, from that fact, supposedly domesticated and wickedly indifferent, if your claim to look ironic, critical, or redeemer . In case this look can be very subtle, concealed within a framework of a side gable; at attention on an object moved, in the restlessness that can not be seen by a siding, or on a generalized sense of inaction. Overall attention to objects and spaces that are not necessarily dysfunctional, nor strive to express meaning. This reading is reinforced by the absence of people which also contributes to a departure from the traditional composition between figure and ground. In terms of these images it becomes subject.